Master the role and responsibilities of the veterinary assistant! 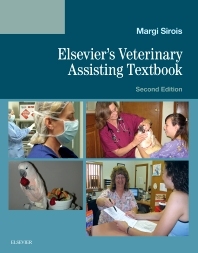 Elsevier’s Veterinary Assisting Textbook, 2nd Edition provides a comprehensive overview of all the skills you need to begin a career as a veterinary assistant. NAVTA-approved guidelines help in learning to assist in laboratory and radiographic procedures, properly restraining animals, setting up equipment and supplies, cleaning and maintaining practice facilities, feeding and exercising patients, collecting samples, handling and dispensing medications, grooming patients, and record keeping. From respected veterinary educator Margi Sirois, this book covers everything you need to know to pass the Approved Veterinary Assistant (AVA) exam and succeed in clinical practice. Comprehensive coverage provides details on the tasks performed by veterinary assistants, and covers everything you need to know to pass the Approved Veterinary Assistant (AVA) exam and succeed in clinical practice. Step-by-step instructions and hundreds of full-color photographs show veterinary assisting tasks and clarify key concepts. Information on office procedures and client relations prepares you to be involved in many of the business aspects of veterinary practice and to work closely with management staff. Expert authors and contributors focus on the topics that are most critical to effective veterinary assisting. Coverage of the workflow in a veterinary practice helps you understand your role as well as the roles of all the other members of the veterinary health care team. Critical Concept boxes highlight important points and provide useful tips to improve your knowledge and skills. Student-friendly features in each chapter include learning objectives, a chapter outline, and key terms, emphasizing the concepts you are expected to learn. A student workbook provides activities to help you apply concepts to veterinary practice, including definitions of key terms, review questions, crossword puzzles, illustration labeling, sample cases, and clinical applications. Available separately.